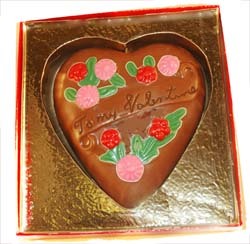 This handpainted dainty chocolate heart makes a great Valentine's gift for a sweetheart or a friend. Solid Swiss chocolate heart, hand-crafted. Each one is different! Heart states "To my Valentine." As delicious as it is beautiful!